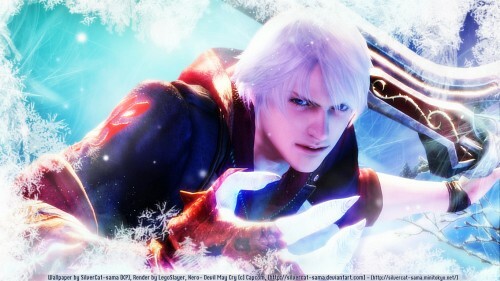 Nero - Devil May Cry 4 (c) Capcom. Well, this is my first DMC wallpaper (Actually I made this at 9 June 2011 ^^). n it's got to be Nero, Because I like him sooo much! I like his attitude, his temper, his fighting style, etc. The background is from Kagaya. I add some frost brushes n many more (cant remember all of them~). nicely done to nero ! I like the snow like borders around him and the interesting details you did to him in general.